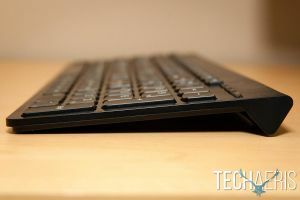 Laptops, desktops, tablets, notebooks, ultrabooks, all-in-ones… there are plenty of choices for consumers these days. 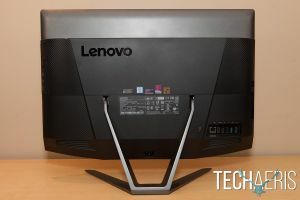 Our Lenovo ideacentre AIO 700 review takes a look at a 24″ UHD all-in-one system that combines power and performance in a compact desktop solution. 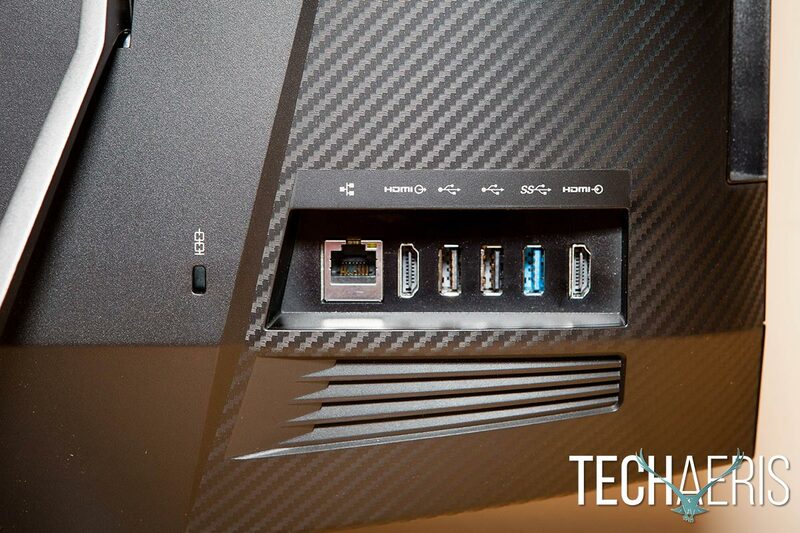 Lenovo’s ideacentre AIO 700 sits on a metal v-stand that is attached to the back of the system. 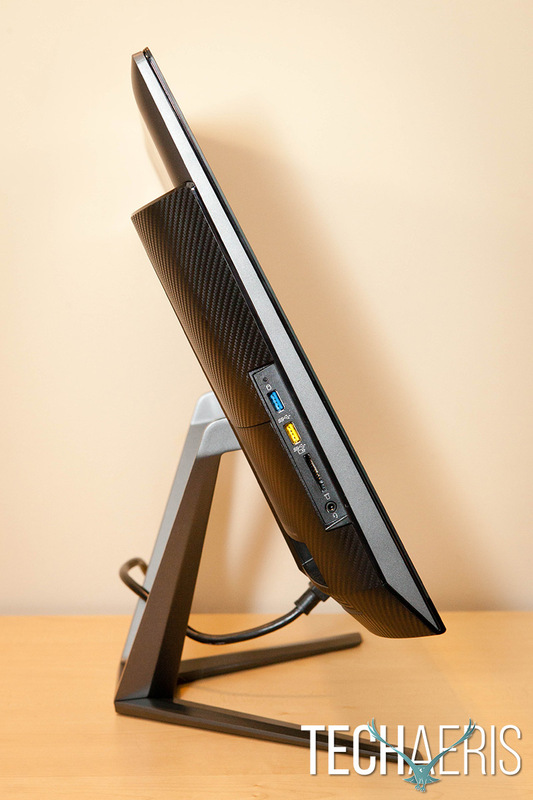 The stand allows the system to be angled from -5 to 25 degrees for optimal viewing. The front of the computer boasts an edge to edge glass screen, but it also has a fairly wide (roughly one inch on the sides and just over one inch on the top and bottom) bezel. The lower left corner has the Lenovo logo in silver, and the camera array is located on the top centre of the monitor. Below the screen is where the JBL stereo speakers sit, one on each side of the unit. 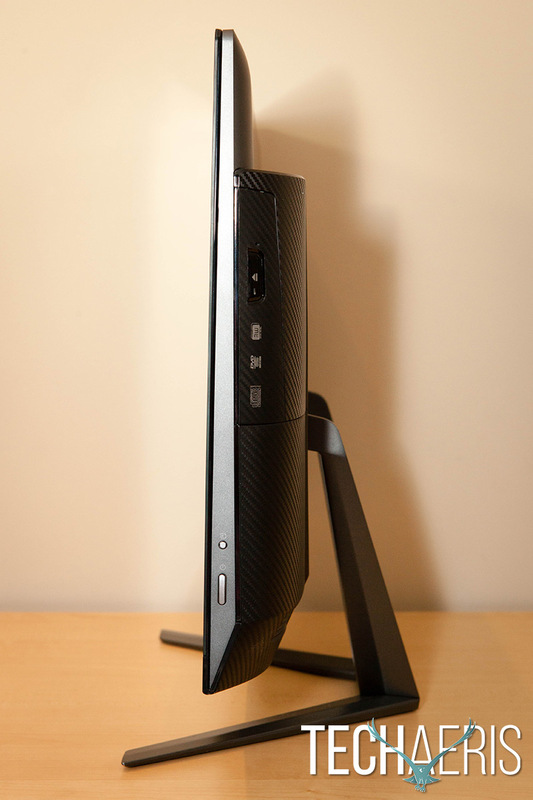 The Lenovo ideacentre AIO 700. The left side of the AIO houses one yellow always-on USB 3.0 port, a second USB 3.0 port, the 6-in-1 card reader, and audio combo jack. The right side is where you’ll find the DVD+RW drive and the power button. 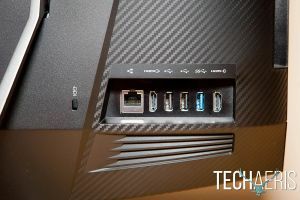 Finally, the back of the system is where you can locate the RJ-45 Ethernet port, HDMI-out, two USB 2.0 ports, the third USB 3.0 port, and finally the HDMI-in port. The back has a nice carbon fiber look on the edges, which is an interesting — and good looking — design touch but I guess depending on where you have your computer set up others may be looking at the back of your computer. The keyboard and mouse are more of the sleek look. It took quite awhile to get used to the included keyboard and mouse and after awhile I just ended up switching to my own USB keyboard and mouse to use with the system. 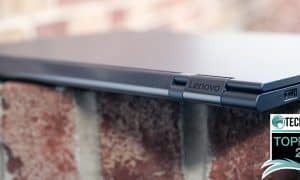 The keyboard has a pretty slick looking low profile design, and unlike other keyboards on Lenovo systems, the function keys default to traditional functions requiring you to use the Fn key to eject the DVD drive, control music, and a few other options. 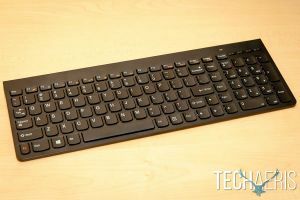 My biggest issue with the keyboard was the placement of the Fn key and I found myself hitting it frequently instead of the Ctrl key. 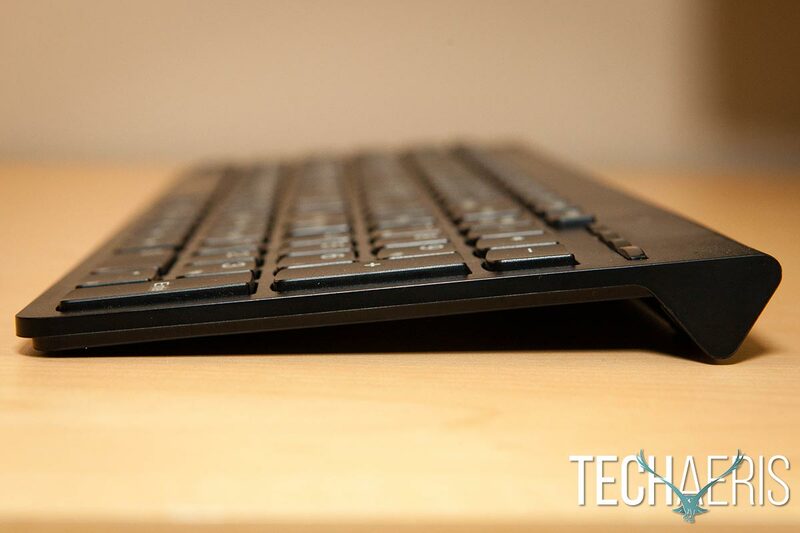 The keyboard has a thin, sleek look and feel to it. Unlike some AIOs, the ideacentre AIO 700 has a tool-free detachable back panel which allows you to upgrade and expand your memory or storage drives easily. Simply remove the metal V-stand by unscrewing the metal screws (yes, you’ll need a tool for this), and then remove the bottom half of the back of the monitor by sliding it towards you. Overall, the Lenovo ideacentre AIO 700 has a nice, sleek, and easy to use design. 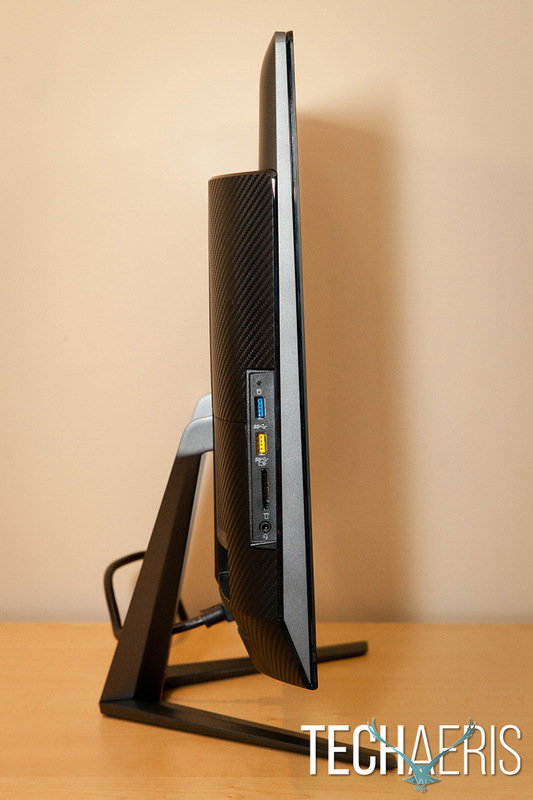 The 4K UHD display on the ideacentre AIO 700 is crisp and clear, although due to it being a touchscreen it can have some issues with glare depending on the surrounding lighting conditions. Based on the setup of my room, it wasn’t very noticeable that often and I just ended up adjusting the positioning so the lights didn’t reflect off of it. If you’re thinking of picking up this AIO, you’ll definitely want to go with the UHD option, I definitely enjoyed the extra real estate for sure. The colour representation is fantastic, colours were pretty accurate and aren’t over-saturated. 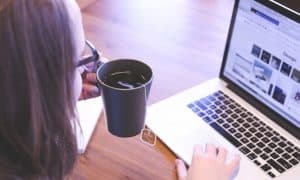 The touch display is super responsive, and like any touch screen laptop I’ve reviewed in the past I quickly found myself using my hands instead of the mouse for some common tasks, including closing and opening apps and the like. Movies were a treat to watch on the screen, especially in a darker room to reduce the glare from the ambient light. Windows 10 on a touchscreen works well, especially when coupled with the Intel RealSense 3D camera (more on that below) for Windows Hello. With the RealSense camera, you can set the system up to recognize you and log you in with facial recognition. I’ll admit it was a bit creepy at first having the computer telling me it was “looking for you,” but it sure was handy being able to just sit down and have it log you in automagically. The operating system ran smoothly with no hiccups or issues at all, and responded well to touch and gesture input. 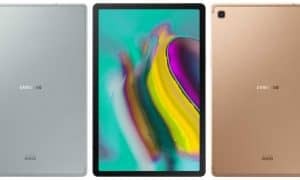 Even though our review unit only had the 6th Generation Intel Core i5-6400 processor (2.70GHz 2133MHz 6MB) and 8GB of RAM, it managed to handle the various programs I tested it with, including Microsoft Office and the Adobe Creative Suite — namely Adobe Photoshop, Adobe Lightroom, and Adobe Premiere. The programs launched pretty quickly and performed well, even with larger photo files both Lightroom and Photoshop handled them with ease. Exporting a video with Adobe Premiere was about as quick as I’d expected as well. An upgrade to an i7 processor and 16GB of RAM would only speed this up if processing time is a factor for you. 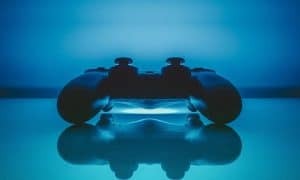 Gaming. Of course we always have to toss a game or three on to test, and the usual Hearthstone and Heroes of the Storm performed great. I was able to get a decent framerate with Heroes running at 4K resolution and medium settings, and Hearthstone is so much more fun using a touchscreen interface. 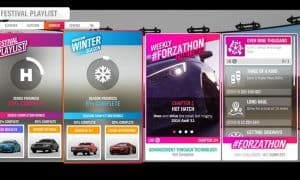 At the risk of being disappointed given that the NVIDIA GeForce GTX 950A with 2GB of RAM was on the bottom end of the Forza Motorsport 6 Apex, I was surprised that I was able to get it running. The detected settings wanted to run at 1366×768, which of course looked pretty substandard on a 24″ monitor with 4K support. I played around a bit with the settings and managed to get it running at 1080p. It did stutter during some of the cutscenes and pre-race, but during the race while in cockpit view the game ran decent enough that I could add to my gamerscore. There were a few times the game froze up and I had to restart it, but overall I was pleased that it ran at all. 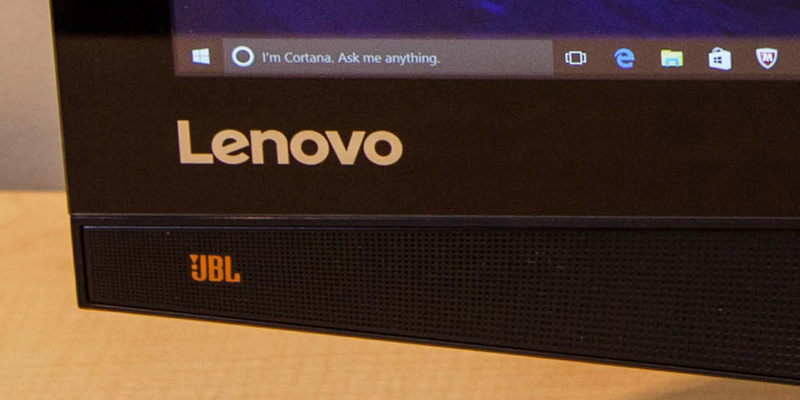 As is the case with a number of Lenovo systems, JBL speakers are once again included on the ideacentre AIO 700. I was surprised with how good they sounded, especially how loud the maximum volume went. The surround sound in games, movies, and music was decent enough to make it enjoyable, although the bass was really lacking (it seems I’m always after heavier bass) I was satisfied with the sound from the JBL speakers. 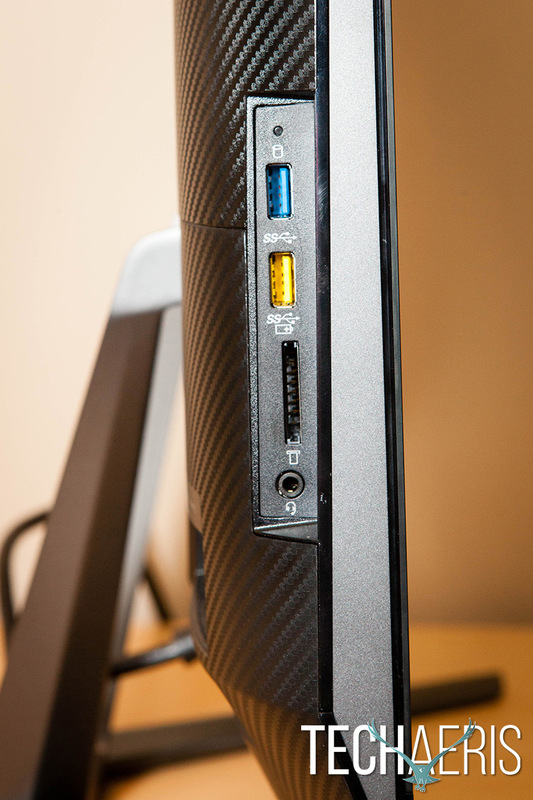 The ideacentre AIO 700 also comes with a Dolby Audio app, and allows you to adjust the sound settings. Presets include dynamic, movie, music, game, and voice, and there is a sixth option called Personalize to customize it equalizer style. Each preset made enough adjustment that it was noticeable, and of course having manual control over sound definitely helps. 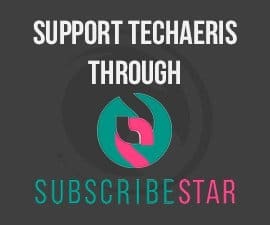 The Personalize option also has toggles for Virtual Bass, Surround Virtualizer, Dialogue Enhancer, and Volume Leveler — each giving you more options for sound customization. The Intel RealSense camera and Windows 10 are a perfect match. Being able to sit down in front of the computer, wiggle the mouse and have the camera detect you through facial recognition and log you in via Windows Hello was a treat — after I got over the creepiness factor. 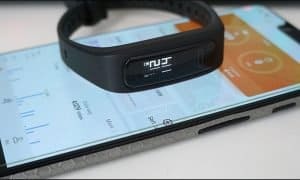 In addition, the camera allows users to control the computer without touching the screen through hand, finger, head, and facial movements, as well as expressions. 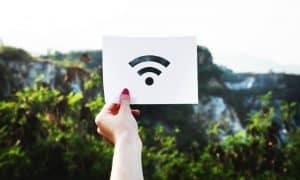 There are a number of apps and games that take advantage of this technology that separates objects and people from background in real-time and captures both the depth and shape of objects. We tried out a couple of them, namely LEGO Portal Racers, 3DMe, ArcSoft DepthCam, and iRFaceRig. I must admit, I was super impressed with all of them and it’d be easy to get lost for a day or two in the RealSense Showcase trying out all the different apps. While some of the results are a bit rudimentary (it took me four or five tries to get a successful scan in 3DMe which could very well be due to the lighting in my computer area), it’s easy to see where this technology is going. 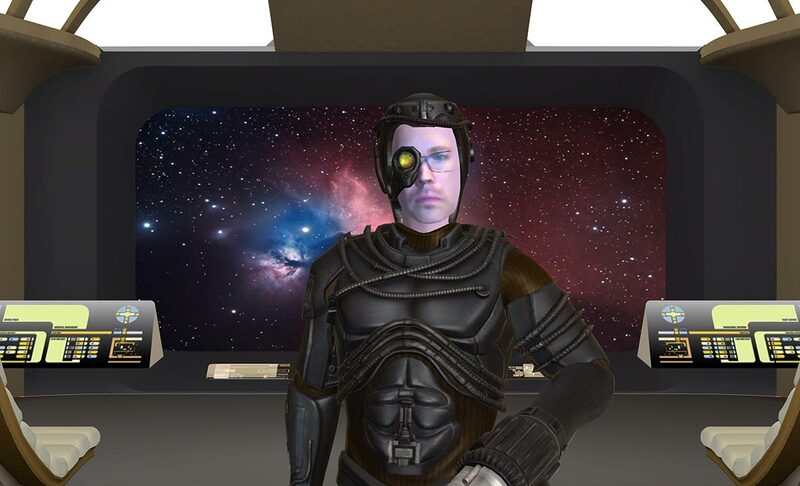 Screen capture from the 3DMe app… I AM BORG!!! 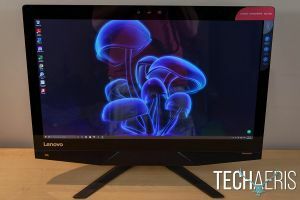 The Lenovo ideacentre AIO 700 with a 1080p (FHD) display starts at $899USD and is currently $100 off on the Lenovo website which makes it a very good deal at $799USD. Our review version comes in at $949.99 at Best Buy and if screen real estate is important, it’s well worth the upgrade to a UHD/4K screen. 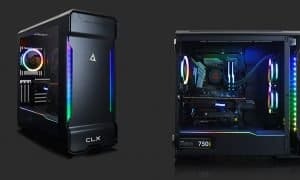 You can also get an upgraded version with the 6th Generation Intel Core i7-6700 Processor (3.40GHz 2133MHz 8MB) and 16GB of RAM for $1399 (currently on sale from the regular price of $1499) should you need or want a more powerful machine. 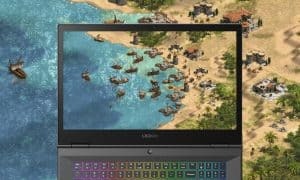 If you’re looking for an all-in-one computer system that performs well and handles most tasks with ease, as well as one that has the ability to be easily upgraded, you should definitely take a look at the Lenovo ideacentre AIO 700 and the various configurations it has to offer. 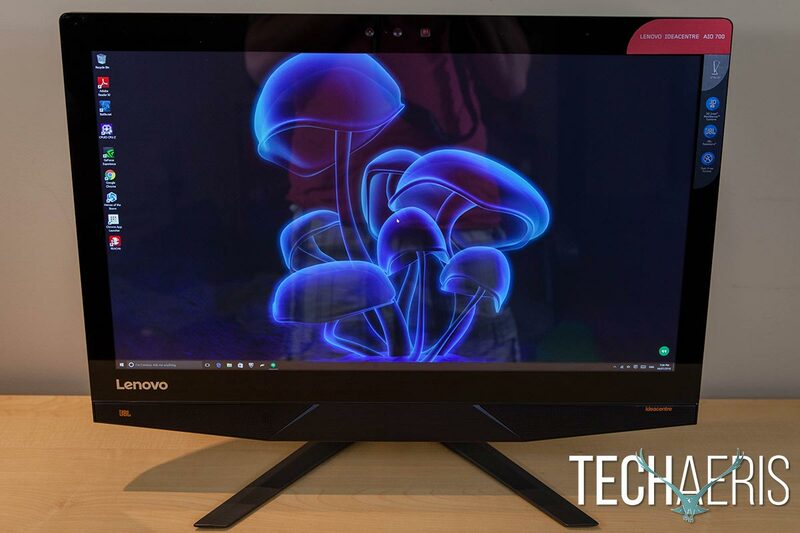 If you're looking for an all-in-one computer system that performs well and handles most tasks with ease, as well as one that has the ability to be easily upgraded, you should definitely take a look at the Lenovo ideacentre AIO 700 and the various configurations it has to offer. 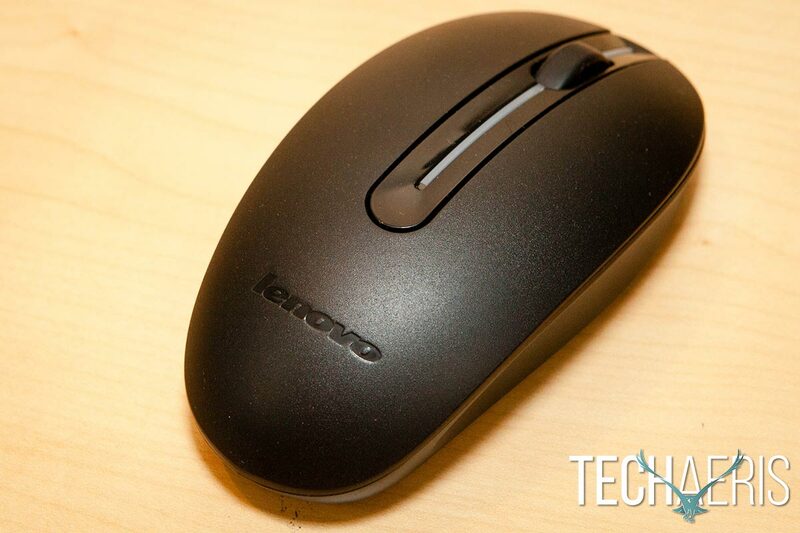 *We were sent a demo unit of the Lenovo ideacentre AIO 700 for the purposes of this review.